Apartment Stella is situated in Soline, a small township in the Dubrovnik riviera. It is on the second floor of the main villa with its own entrance. A studio with 2 bedrooms, a bathroom, kitchenette, balcony with sea view. A terrace in front of the house, under the shade of an olive tree, is cool and relaxing in the summer. Across the road to the villa a stairway leads you to a beautiful, peaceful beach. The property has its own private parking. A bus stop is a few minutes from the house and a regular bus service takes you both to Dubrovnik and the nearby town Cavtat. bathroom with bath, overhead shower, wc and hand basin. Towels are provided. Part of the studio apartment, table & chairs, SAT TV. kitchenette fully equipped with refrigerator, freezer, stove, oven, kettle, dishes and cleaning devices. Beautiful views, lovely apartment, idyllic beach, friendly people:- everything we wanted for a relaxing holiday. Short walk to local bistro or a bit further to the delightful restaurants of Mlini. Stella and her family were welcoming and helpful, and we have no hesitation recommending this apartment. Over 200 steps down to the pebbly beach, but very much worth the effort as it is unspoilt and quiet. Bus stop close by but bus times could be a little unpredictable. All in all a wonderful break, thank you Stella. This apartment run by Stella was everything its Owner's Direct billing had promised and, because of the kindness and generosity of Stella and her family, our holiday there was wonderfully relaxing and regenerating. Stella is a very attentive and considerate owner and runs the apartments with great care and efficiency. 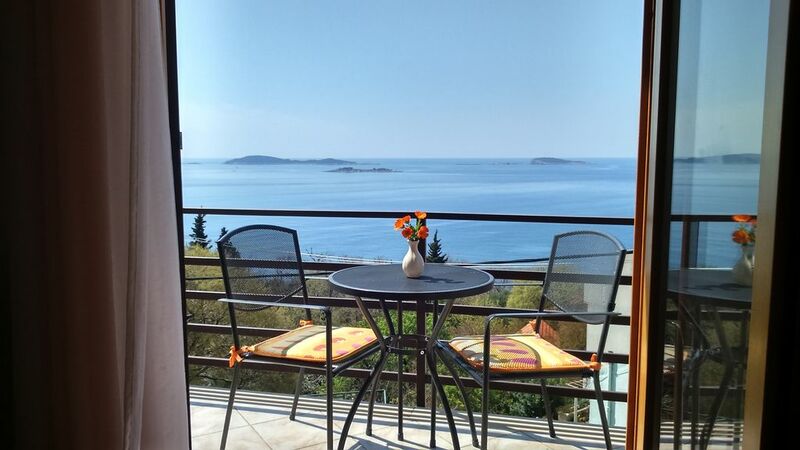 The situation of the apartment is excellent - the views over the sea are tremendous and it is close to the main road to Dubrovnik and not far from a good restaurant and a handy shop. Completing all this (and the repeated destination of our stay) is the compact and scenic beach which is 260 or so steps from your bedroom! The steps and the beach are maintained by the people of Soline who take great pride in providing just the right level of facility, keeping their tiny corner of the Adriatic accessible, magnetically attractive and non-commercial. Altogether we had a very happy and simple holiday in Soline and heartily recommend Stella's apartment. Die Besitzer waren stets hilfsbereit und freundlich. Nous avons séjourné 5 jours dans cet appartement. On peut apprécier la vue splendide sur la mer depuis le balcon ! Une terrasse destinée aux locataires permet de prendre les repas dehors, un parking est disponible pour les locataires, climatisation , TV , accès internet. L'appartement est bien situé près de la route principale menant à Dubrovnik, près du superbe village de Cavtat et de toutes commodités, près d'une superbe plage agréable et calme! Merci encore à Stella pour son accueil ! A beautiful pebble beach is 100 metres away reached by stairs. There are several other beaches a few minutes drive by car or 10 -15 minutes walk in Mlini and Plat. The nearest airport Dubrovnik Cilipi is 8km away. The port of Gruz is 12 km away. The nearest bus stop with regular bus connections to Dubrovnik and Cavtat is a few minutes walk. A car is not necessary but can be handy. Local shops, restaurants and bars are about a kilometer away. Supermarkets, banks, ATM machines are a few kilometers away. Various excursions or day trips to the nearby islands, boat rents, etc. can be organized in a tourist agency in Mlini.